Rebecca from Hello Marzipan recently shared this tutorial for these Anthropologie inspired loop earrings. I was excited to see the the Craft of the Day for yesterday from Martha Stewart was a tutorial on making a gemstone bib necklace. Since it seems to be an unintentional theme of this blog this week, here is another big bold bangle which includes textile. Here is another big name design brand inspired piece. Again, this one includes textile for a soft and elegant look. If you liked the Anthropologie inspired Bonheur necklace by Infarrantly Creative, you might also like her latest creation. The new course schedule for the Craft Alliance in St Louis, MO is now available. Saucy’s Sprinkels posted an excellent tutorial on a self invented version of necklaces at Anthropology and Urban Outfitters. Great photos and instructions included. Plus pictures of a very yummy looking cake! 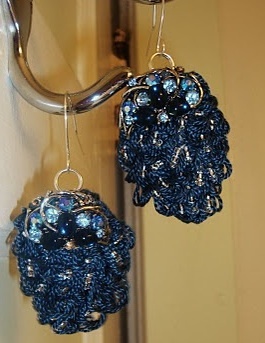 The Beading Gem’s Journal posted excellent tutorials on using t-shirts and recycled clothing to make jewelry. 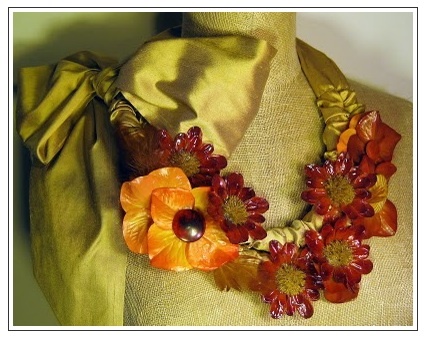 I loved the draped necklaces, but there are styles for lots of tastes. Shirley Anne Sherris’ new book Embroidered Jewellery is now available on Amazon. Today’s Artist Mini-Interview is wth my new friend Deryn Mentock. Deryn is an extremely talented mixed media artist and her work is outstanding, as you can tell by the teaser photo. Win a copy of The Naughty Secretary Club: Working Girls Guide to Handmade Jewelry.